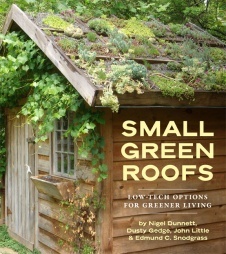 Small Green Roofs is the first book to focus on small-scale and domestic green roofs. More than forty profiles of small and domestic-scale projects of all shapes and sizes include green roofs on sheds, garden offices, studios, garages, houses, bicycle sheds, and other small structures, as well as several community projects. For each project, details are given for design, construction, and installation, as well as how-to tips on how the roof was planted and cared for. For readers looking for inspiration when hiring a contractor or taking the adventurous step of building their own, Small Green Roofs provides the knowledge and encouragement to make it possible. There are more than 200 photos over 250 pages. Well worth a browse.